City directories, the forerunners of telephone books, provide the primary vehicle for mapping the new family lines in the United States. All locations are in Milwaukee, Wisconsin unless otherwise noted. In 1930/31 there were drastic changes to the names and numbers of Milwaukee streets, we have used the new names here. (tba)=Presence asssumed. Directories typically list only male HOH. Arrival 2-Jun-1851; Le Harve, France to New York on ship George Turner. Next to him in line is Franziska Hauswirth, his future wife. Since she was not from Johlingen, we assume that they met on the ship. Son of Johann's oldest brother, Franz Anton Reichert, comes over to Milwaukee and lives with Johann. Is the address a typo or is this prep for moving to Market St? *The new baby, John, is an enigma and there is no evidence of him after this. We will assume an early death. Franziska Hauswirth Reichert has died. Related to childbirth? Louisa marries Franz Joseph Memminger 07-Nov-1871. Louisa and husband live next door at 575 Market St. There were three other Barbaras immigrations to the town of Long Grove, Illinos, just north of Chicago. It is possible that he traveled there first. *I think that this is David, again using the name "John". This is most likely when and where David met Caroline. Mr. Reichert ran a saloon on the first floor of his house at the corner of Johnson & Market, right in the middle of Blatz Brewery complex. 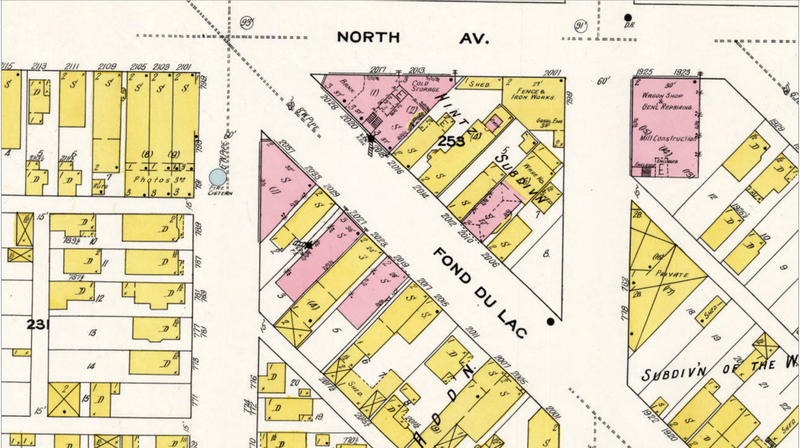 David was a boarder one block (1894 map) from the Reichert saloon and was working at Blatz Brewery. It can be speculated that he ate dinners there or stopped there after work for a pint. And, perhaps, Caroline worked there. 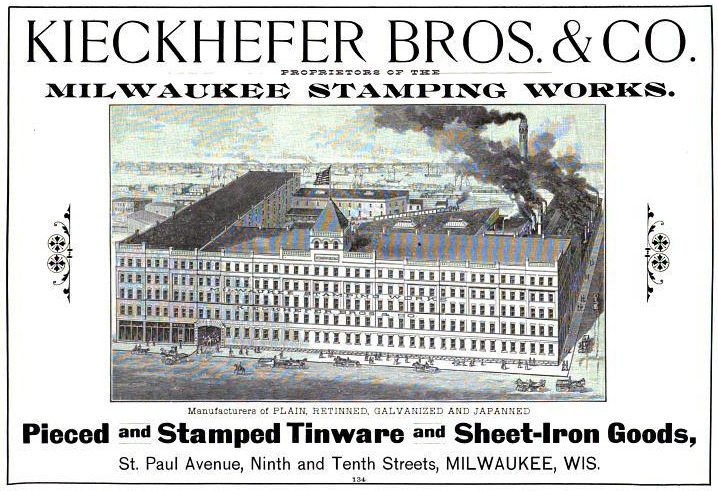 (Note that by 1894 there was no more 579 Market as Blatz had expanded. Northeast corner of Johnson & E. Water. 2 blocks from the Reichert saloon. 89 Knapp is still close to Blatz which brings up the question of whether he was still working at Blatz in early 1876. Perhaps he took a job at Schlitz but hadn't relocated yet? Charles is also listed as gas-fitter in the business section. This seems at odds with upcoming work in a brewery as a cooper. Everyone is living at #579, could there be two Charles? David moves north to be near Schlitz. He presumably kept in touch with Caroline. Who is Henry? A cousin who works with Charles at Miller's? David Barbaras is naturalized (Record); Witness, Anton Rieck, is listed as a tailor. There is an Albert Rieck who lives at 83 Knapp, close by Blatz and David's old address of #89, connection? Witness #2, Henry Heizer, is not listed 1879-1881. Was George Barbaras somebody living with David but with a different last name? There are no plausible George Barbarases that I can see in the U.S.? Eleanora reports that Caroline was "a very good zither player"
Emilie Kosack married Max Doerschlag in Germany. They, along with Emilie's 24 year old brother, Wilhelm, come over to New York. There are 3 unidentified Kosacks with them. The two oldest Wilke children, Hermann and Bertha come over first, in 1884, on separate ships. Alvin Falk wrote Bertha that there were lots of jobs in Milwaukee and that presumably established Milwaukee as the final destination for all the Wilkes. The naturalization record for Charles Wilke that shows an immigration date of July 1884 seems solid. The two witnesses at the ceremony were Frank Lenzner, polisher living on Second Ave., and William Dolgner who lived on 3rd ave., were also used by Herman Gutknecht (husband of Emma Wilke) at his naturalization. who is missing in the directories???? Oldest child of Albert Wilke and Wilhelmina Greffin and older brother of Bertha Wilke, the future wife of Alvin Falk. Earned money which he sent to his sister, Bertha, to come over. She met future husband, Alvin Falk, on the ship. She and Alvin would beget Eleanora Falk, wife of Harry Barbaras. Alvin went straight to Milwaukee; Bertha went to be with Hermann in Pittsburgh. Did he come alone, with family friends? Arrived: Nov 15, 1884 in Baltimore on the ship Hermann along with his 17 y.o. sister, Mathilde Falk. Charles is back with his father. Where was he? Arrived: 15-Jun-1885 on the ship EMS They came from Pollnow, Germany, part of Pomerania in Prussia, and now part of Poland. Johann (John) and his wife, Bertha Winter Falk along with and three of their children, Maria (21), Carl (10), Robert (9). No listings available until 1886 except for Hermann. Are they in Milwaukee yet? Eleanora Falk Barbaras reported that Hermann was doing "forestry" work in Pittsburgh and that his younger sister, Bertha, was doing house work to earn enough money to bring over their parents and siblings. Father of Alvin has just emigrated but is not listed yet. Children Maria, Carl and Robert came over with him and children Carl, Charles, and Robert show up in the city directory in the following years. Hermann, August and Albert Jr., the older children, should start showing up in the listings but there is nothing until 1890. Mystery. Are they somewhere else, a smaller city that does not have a directory record? Seven additional Wilke children eventually show up in the city directories. Have they come over yet? August is 20, the others may be too young to be listed. Bertha comes to Milwaukee. Is Hermann still in Pittsburgh? She is living within two blocks of David Barbaras' house on 29th. Her husband is a cabinetmaker. Blatz Brewery took over his previous location at some point. Son, Charles, has moved out again, to 658 E. Water St.
Johann et. al. came over in 1885 but the new children are not listed in Milwaukee until next year. Too young? The Wilkes appear to be the primary drivers of the complex. The Falks are living in the rear of the house. We assume that this is John the father as he recently moved out of his long time location and is getting older. Still no sign of Herman, August and Albert Jr.
Arthur is wet-nursed by Mary Henrietta Reichert, wife of Michael Reichert, who lived on N. 7th, approx 2 miles away. John is now working at the saloon of Louis and Auguste Richter and living in the building. Biddle Street (see inquest ref. ), now East Kilbourn Avenue, ran from the lake bluff to the river. On the other side of the river was Cedar Street, now West Kilbourn Avenue, which originally extended west to N. 12th Street. In 1929, a bridge was erected, the road was widened, and the two streets became one with the new name of Kilbourn. Her husband dies 20 Feb 1889 after a long illness. Emily (tba) living with mom at 2468 Kilbourn in census 1895? Name misspelled as Wilcke in the city directory. Are the children here yet and why aren't they listed? Albert Wilke the elder dies 1-Jul-1890 and will no longer be listed; this is consistent with Eleanor's report that "he fell backwards on an iron picket fence and he died" The 5-Jul-1890 issue of The Weekly Wisconsin reports that he was overcome by the heat while working on a new building on Jackson St. and fell off 4th floor scaffolding to the pavement. Charles moves out, did he get married? John listed as "died March 9, 1893"
Albert is listed as a cutter and a pursemaker living at 1148 22nd St (nearby) in 1893-94, then apparently returns to W. Medford in 1895. Charles marries Martha Zellmer but does not move. The actual marriage date might be 1896. Charles Wilke works for years at Kieckhefer Bros.
Albert Gardere, future husband of Louise: Cigar maker. 691 Market St. He grew up in New Orleans, was a cigar maker there, then moved to Chicago in 1897 where he was a cigar maker. How did they meet? Louise (listed as "Lizzie") is a servant with the Schiff family, 1539 (formerly #759) Cass St. This is about 8 blocks from Albert Gardere's cigar shop but I have no idea how she met him. Albert left his birthplace of Louisiana, showed up in Chicago in 1897 as a cigar maker, and moved to 391 Market St. (near Schlitz factory) in Milwaukee in 1898. In 1901 he has a new address at 301 5th St. which may be a signal that he married Louise. Betha and Robert have relocated from Walnut St.
Bertha Winter Falk likely dies 1902-1903. Eleanora reports that "Oh, the funeral. She died from a hernia. Her hernia came forward and it was so big that the inside that it tangled her intestines... something burst and that killed her. See, they had nothing to cure them at that time yet, we didn’t have that many doctors. Dr. [Bernly] lived on Fond du Lac Ave. and all that. He was just a young doctor, not very, and he came but he couldn’t push this back, you know, so in four days she had passed away. So then she was laid out… How old was she then? Sixty-two. She was laid out in the house and then she went to church. They had a church funeral. The church was very small at that time, you didn’t have the large churches yet. And the children were all dressed in white and they had black ribbon sashes on and black ribbon in their hair." 2478 West Medford Ave2 Bertha (Winter) Falk widow of John This is the final reference to Bertha Falk. Is she near death? Ida lives around the corner with hew husband; Note that Herman Raddatz lives at the same address as borther Albert Wilke; Eleanora was quite exercised by the claim that Ida "married her own cousin"
1029 30th St. Charles Wilke (and family) foreman, Kieckhefer Bros.
1034 29th St. Charles Wilke (and family) foreman, Kieckhefer Bros.
[It is reported] David Barbaras held the position of chief bartender aty Schlitz giving out the free beer to the employees and was for some time Milwaukee's champion beer stein holder. He held the record for the number of steins of beer he could hold and serve with one hand. When there was an opening in the brewery David Barbaras told son, Harry, to apply for the job. Harry got the job and was assistant on the bottle wagon, delivering beer to saloons and collecting the empty bottles. David's heart was set on Harry being a steam fitter, so he sent the boy to school to learn the trade. Harry, however, did not like steam fitting, and he wanted to work on a boat. He worked as a helper to a steam fitter, still watching his chance for a job on a boat. His chance finally came, and he took it. It was a job as a deck hand on a Great Lakes freighter, the Joseph C. Gilcrest. From then on for about two years he worked on different ships, generally going from one end of the Great Lakes to the other and finally becoming a wheels (roundsman). The pay was quite good, but he saw that there would be a better season ahead for steam fitting so he left the ships and went back to his old trade. Albert Gardere disappears from the directory; Louise and he have presumably married and probably have left for Mobile, AL. They will be in Mobile until approx. 1034 29th St. Charles F. Wilke (and family) foreman, Kieckhefer Bros. The Muths were renting rooms to boarders (not clear if it was above their tavern or on West Medford) and Eleanora was preparing meals for them. Harry Barbaras was living with his father at 454 29th but David Barbaras decided to remodel the small house at the back of the lot and Harry lived at the boarding house while he did the work. 2424 Brown was at the norteast corner of 24th and Brown, 5 blocks south of the West Medford houses. Currently a vacant lot. [Eleanora notes] Jacob Muth was a driver, teamster, for the Waukesha brewery. 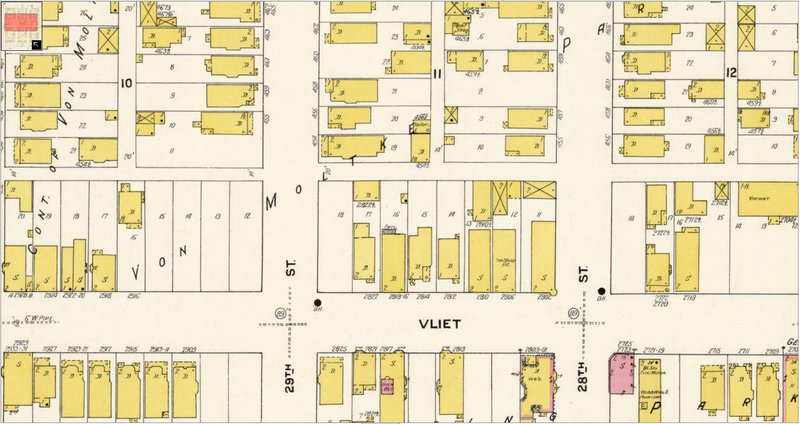 But the conditions in winter were brutal and the Muths bought a tavern on Vliet St. between 25th and 26th streets, next door to the butcher shop of their friend, Gerhard. They lived ustairs and then turned their house at W. Medford Ave. (Kilbourn) into a boarding house. [Eleanora notes] He [Harry] was working on the boats and he came back home and his father was remodeling the little rear house and they had no room for him to sleep so he came over there and asked for a room. And there was a room right downstairs next to the kitchen so they rented that room to him and he was doing steam fitting work. He worked for, I forget his name now. [Knar, Frank Knar]. His little shop was in the village of Wauwatosa, all this while, yet I think it’s still there. Wilke children move into 2228 Kilbourn Ave.
Clara Muth telephone operator, Wisconsin Telephone Co.
Harry Barbaras and Eleanora Falk married 30-Jun-1917. They were married in the front room of 2480 by the minister from Nazareth Lutheran Church, the service was in German. Alvin Falk added a room to 2480 and the Falks moved upstairs while Harry and Eleanora lived downstairs. Clara Muth supervisor, Wisconsin Telephone Co.
Loretta disappears and has presumably married Harold Burroughs and moved into his house; Harold has lived at 1714 Chestnut for several years and she is listed there in the 1920 census. Mobile Alabama Albert Gardere Ship carpenter at Mobile Shipbuilding Co. Listed here, with wife, on WWI draft registration. Albert has apparently changed occupations. 2478 West Medford Ave2 Herman Gutknecht foreman, AOS Co.
Emma Muth stenographer, Aug. Rebhan Co.
1034 29th St. Charles F. Wilke (and family) foreman, National Enamel and Stamping Co. In the 1920 census she was a maid in Manhattan. No idea what was going on there. She was later back in Mobile and the couple returned to Milwaukee circa 1928. Glen reports that they returned with a truck filled to the brim with possessions. By 1930, Louise was living with her father and they were divorced. Glen reports playing with William Hackbarth (lived next door on the northeast side) and Harvey Dalli, (lived in the fifth house to the south east). Harvey Dalli "had a barn in his yard in which a lady boarded her pony. The pony, however, grew sick and died and a large truck came and took it away. They erected a huge tent over the door to Harvey's barn. The tent was made of empty flour bags sewed together by Harvey's mother. They then had two forts, one in Harvey's tent and barn, and one in Glen's shed, so they were constantly playing cowboy and Indian, all arrayed in their cowboy and Indian suits with about half a dozen guns stuck in their belts." Esther Gutknecht tmkpr, Imperial Knitting Co. ? ?/ right behind the house???? Florence Gutknecht stenographer, Wacho Mfg. Co.
John H. Muth manager, Palace Drug Co.
[Reported by Glen Barbaras] Emma Gutknecht had 3 children: Erwin who never married; Esther who married Walter Barkow and moved away; and Florence who married Arthur Barkow, moved upstairs at 2478 Medford Ave. and started a family. They all met at the Lutheran church. Florence played with Gordon (Barbaras) and me as younger kids and we,cin turn, played with her kids one of whom was Nancy for whom Gordon named his plane, Fancy Nancy. Art got his Ph.D. in physics at Marquette but did his research at Chicago using their equipment. Note: by 1929 Kilbourn Ave has been renamed to Medford Ave. with the same street numbering. Oddly, e.g. August Wilke there are Kilbourns mixed with Medfords for the same family. Kilbourn later became West Medford and the numbering was changed. 1 2424 Kilbourn Ave. 2480 W. Medford Ave.
2 2422 Kilbourn Ave. 2478 W. Medford Ave.
2420 Kilbourn Ave. 2474 W. Medford Ave.
3 2418 Kilbourn Ave. 2472 W. Medford Ave.
2412 Kilbourn Ave. 2464 W. Medford Ave.
4 2408 Kilbourn Ave. 2458 W. Medford Ave.